This are wonderful homestead chickens with great instincts. 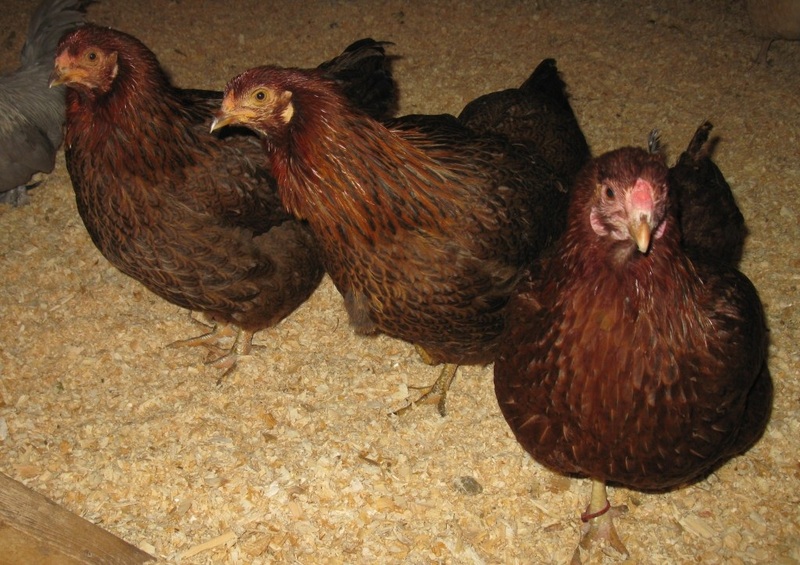 The hens go broody fairly regularly and are great mothers on account of the Cochin background. The leghorn influence means these birds lay very well in between. The hen below in the video is ours and is an excellent broody. They are a great cold-hardy dual-purpose breed. The dark Cornish in the breed means more breast meat than usually seen on a heritage breed chicken and our birds are meatier than they have ever been. Here is an article on our experience with partridge chanteclers and the breed's valuable characteristics. We have 10 hens (Blehms-Michigan & Roblyn Eyrie x Performance Poultry) & 9 pullets (Blehms x Chickees Mom or Chickees Mom x RE/PP) and are using the best 13 females for hatching eggs. I have 1 gorgeous rooster in with the hens, shown below. The fellow on the left is his father, and was hatched from eggs from Alberta (Chickees Mom) and the larger darker rooster on the right is his son bred here, likely mother was a John Blehm hen. 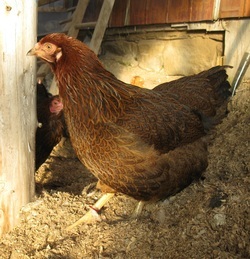 We should have plenty of eggs available due to hen numbers and these lay well even in the depths of winter. We do have a Roblyn Eyrie Rooster and a Pure John Blehm Rooster too. Anyone getting eggs from me in 2011 will have had the latter's offspring. Partridge Chantecler Rooster from ChickeesMom in Alberta for breeding this year. Partridge Chantecler Cockeral Son of Rooster from ChickeesMom in Alberta & John Blehm Hen for breeding this year. He's 4 months old here. 3 adult Partridge Chantecler hens for breeding this year. Part of the group of 13 hens.